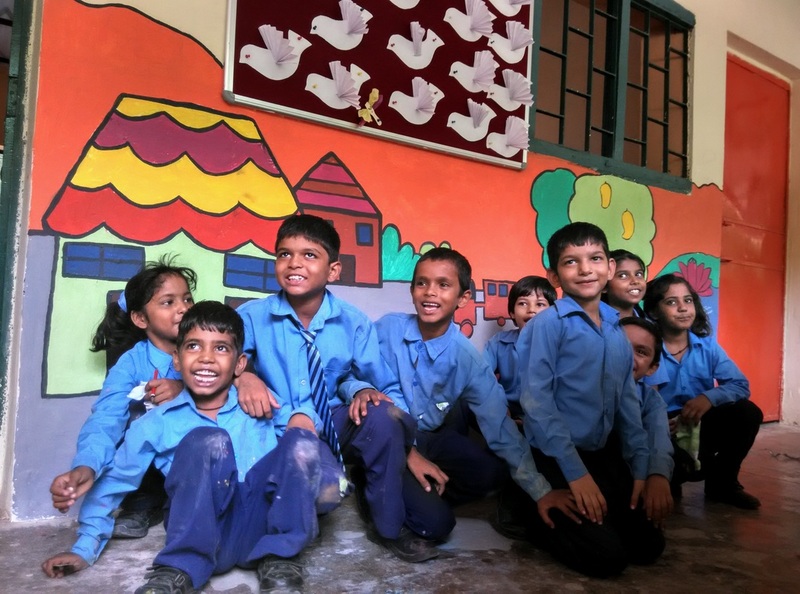 Volunteer residencies connect artists with NGOs in and around Delhi. 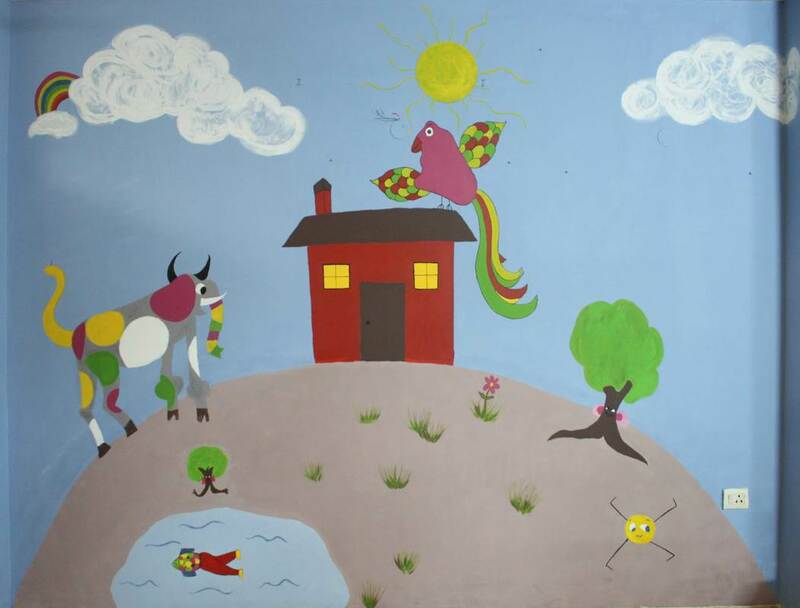 The typical outcome of the residency is a mural in the children’s space. The children really enjoy the process of mural-making: the brainstorming of ideas on paper (during which time they pick up new techniques), the transferring of their ideas on to the wall, and finally the painting. Of course they then get to live with the outcome, and enjoy their work for as long as it lasts. From the moment an artist or an organisation approaches us we take immense care in curating the interaction. We look for a good match, placing artists carefully – taking into consideration their experience, their language skills, their available time. 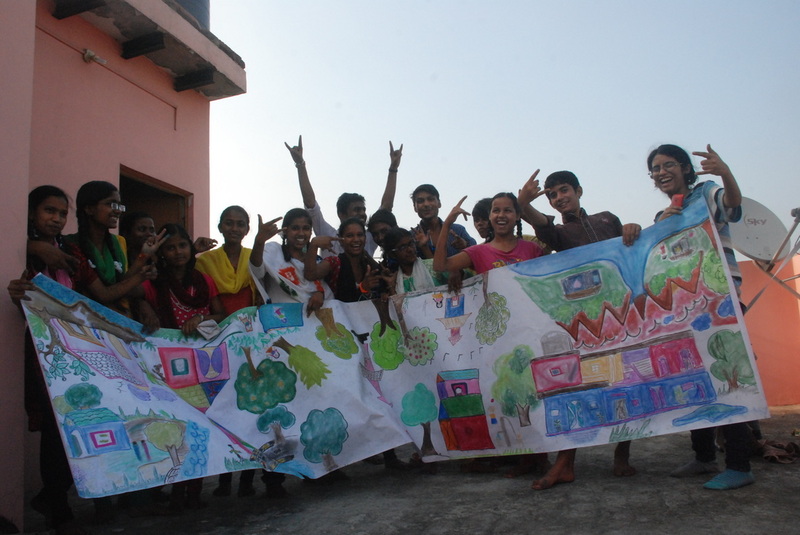 We help to conceptualise a project with its stakeholders: artists, kids and NGO or school staff. We provide materials and will support as much or as little is required during the project. The artist’s role in an Artreach project is to enable children to realise their vision for their space. To help them explore their ideas, transfer them to the wall, and then execute them so that they end up with something they feel proud of and happy to live with. This can be an immensely empowering activity for these kids. Along the way the artist imparts all sorts of skills and techniques as well as ways of seeing that might be new or different. Every project quickly develops its own energy. They always feel different and the walls have a distinct character at the end. We have partnered with NGOs Salaam Baalak Trust, Aman Biradari-Rainbow Homes, Jamghat, Karm Marg, Udayan Care, Yuva Ekta Foundation. To read more about our NGO partners, click here. Our volunteers have been Indian and International artists. To read more about the artists we work with, click here. Read more about experiences with Artreach. Artreach takes pride in managing each project with great care and sensitivity so that the experience for all participants is transformative, something they will never forget. If you would like to apply for a volunteer residency, please email our Programme Office at artreach.india@gmail.com. Recent graduates from Ambedkar University, artists Vidhi Sharma and Anarya Dodes spent 3 merry monsoon mornings with 17 Grade 2 children of the MCD School, Police Training Colony, Malviya Nagar​. They made a pile of drawings and 1 large scroll which resulted in 2 lively hopscotches and a mural. We thank all the members of Artreach for conducting 3 days workshop for students of PTS centre. Students are very happy to play hopscotch early morning and during break time. Younger children learn counting written on the poles. The wall outside 2nd class looks colourful. Children are eager to paint remaining walls as well. One of the child from 2nd class (Radhika) said 'Mam,Majja aa gya' (Mam, it was fun). Teachers also enjoyed, giving it a finishing touch. We are looking forward to have many such activities in the school in future. For older projects, please visit the Artreach India Archive.